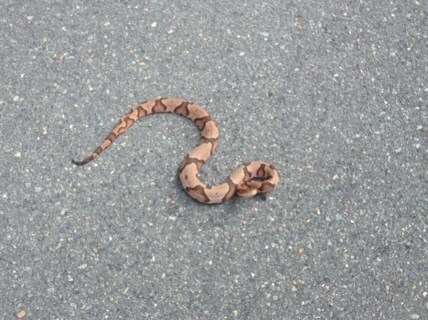 I was riding along today in one of the neighborhoods I work in, when I noticed the copperhead in the road. I got out because these sightings are in fact rare; at least when compared to sightings of non-venomous snakes. 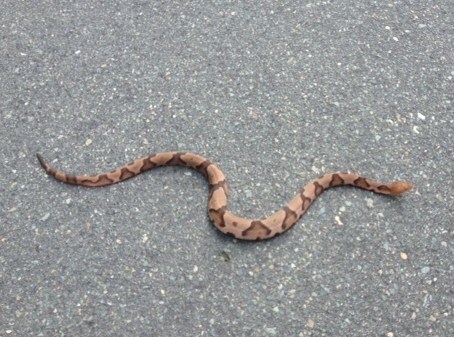 So many people think every snake they see is a copperhead or a water moccasin in the southeast…again ridiculous, so they kill them; or get themselves bitten for their ignorance. For the most part, I try to not to judge people with children or pets who kill actual venomous snakes on their property; I understand. But all too often I see, especially on social networking sites, where people have killed harmless snakes, snakes that in fact are very beneficial to your property; simply out of ignorance and fear. Snakes such as black snakes, ring necks, racers or hognose specimens, while being non-venomous, cut down on rodent populations or even other pests which in fact can spread disease. At the same time snakes do not transmit diseases to humans. Even the salmonella thing is a myth for the most part. Snakes cannot transmit salmonella through a bite. However, any egg-laying animal; bird, snake, turtle or chicken can have salmonella germs on their bodies. So even though this is rare, it is best to wash your hands thoroughly after handling any of these creatures; that is if you aren’t gripped with fear because you were taught to be afraid by other fearful people. My x-wife’s family was horribly afraid of snakes. But as I helped to raise her little girl, I decided I wouldn’t allow that to happen to her. We had ribbon snakes, ball pythons, red-tailed boa constrictors and even many native species in the house, at different times of course; well kinda (I was a licensed wildlife rehabilitator with the state of NC at the time). Alyssa and I really enjoyed snakes and lizards and I recall her mother loosening up quite a bit as the years passed and she saw her little girl exhibiting no fear of snakes whatsoever. You see she was taught NOT to fear something she didn’t understand; and instead she was taught to understand it, which led to the absence of fear. This is mighty empowering when it comes to raising a child. But when it is applied throughout our lives, it is more important than we can possibly foresee. The absence of knowledge, which all too often leads directly to fear, transcends the issue of fearing spiders and snakes as children; and can transform into fearing your neighbors and fellow citizens later in life; because of their color, or their religion, or the food they consume, or their traditions. This leads to turning away from people that could well be great friends; and when we are not careful, and we allow the proverbial mole hill to become a mountain, it can lead to far worse. This makes it so easy for us to be comfortable with killing that which we do not understand. So instead of killing this gorgeous creature today, I grabbed a lengthy branch from the side of the road and shooed the venomous creature into the woods where it would be safe, and no one would come along and possibly get themselves bitten trying to kill it. I figured it could find somewhere safer to thermo-regulate. Or perhaps I sent it directly into the line-of-sight of a hungry raptor. Who knows? But one thing is for sure. It was an awesome specimen and I enjoyed at least feeling like I had done the right thing.